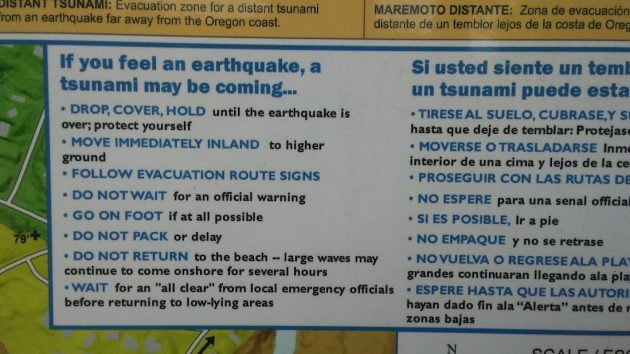 There are signs at all the marked entrances to Oregon beaches telling us what to do when a tsunami is expected. But how do people on the beach get warned when a tidal wave may strike but is still some ways away? A four-page brochure available online (“What to do if there is an earthquake/tsunami”) says you can establish an account with Citizen Alert, which will send you a phone message. This is useful if the tidal wave is ecpected in a matter of hours. But it’s no help to visitors to the coast and anybody else who just happens to be on the beach itself. Some towns along the beach evidently have installed sirens, which I didn’t know when I was contemplating this issue on a foggy beach Sunday. Those sirens are supposed to sound for three minutes at a time when the occasion comes up. I’ve never heard one of these sirens being tested, which they should be on a regular basis, I don’t remember it. So maybe the testing doesn’t happen all that frequently, or maybe it happens only when I’m not around. Instructions for when you feel an earthquake that’s close enough to spawn a tidal wave. Every day at 12?! Obviously you’ve never heard one or you wouldn’t say that! Lol Believe me if something drastic and dangerous happens, no matter if you’re only a visitor to the coast, you WILL know about it. No everyday obnoxious alarms necessary. Would you like Albany to have an everyday alarm for potential toxic catastrophe? Prior to moving to Albany in 2016, I was on the Emergency Management Incident Management Team in Jefferson County, Washington, which is where the Strait of Juan de Fuca turns into Puget Sound. Jefferson County also has a border on the Pacific Ocean. We had three of the sirens, which one of our volunteers named “AHAB” for All Hazard Alert Broadcast. The sirens could be triggered by the State or by local emergency management. Each siren has a voice broadcast capability, so that emergency managers can give instructions to the public during the broadcast. The Sirens were tested monthly using an audio file that played the Westminster Chimes and voice that said “This is a Test” along with some instructions or info multiple times. A real alert would play for 3-minutes continuous and then repeat, and would contain a message appropriate for the situation. For example, we tracked one “distant tsunami”, started in Japan, for two hours before it hit Jefferson County. We were able to alert people to the fact that one was coming and the amount of time they had to get off the beaches. Fortunately, it was less than a meter high when it hit the outer coast. Each siren has multiple amplifiers, called “doughnuts”, stacked on a telephone pole. We had one that had 5 doughnuts on it. They were loud enough to damage eardrums if you were standing close during a real alert. If you are on the beach and the sirens go off for a real alert, RUN! Tsunamis can travel at over 600 mph, and if you are on a beach and can see it, you are in trouble. Slight addition to my previous reply. Tsunamis originating on the Cascadia Fault, off Oregon and Washington, take about 30 minutes to hit the Pacific Coast and another 90 minutes to hit Port Townsend, WA. Distant tsunami originating in Alaska or Japan take longer. Also, each siren costs a lot to install and maintain. A multi-doughnut siren was about $12,000 to install, and about $1,000 per year to maintain. FEMA had a schedule for installing sirens up and down the coast – but not all counties can afford it. The numbers are old, and hopefully, have come down since we installed the ones in Jefferson County.